Star Trek: Discovery is a hit and one of the most representative shows on TV. Representation is part of the rich legacy of Trek . 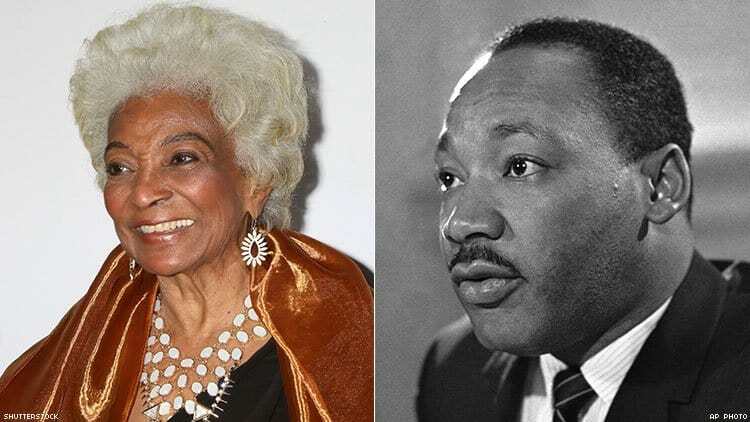 But it almost all fell apart until it was saved by MLK Jr. —Nichols—who played Lt. Uhura on the original series reveals a little known piece of Star Trek lore. I hope you will get the story right this time, because for some reason, no one has ever gotten this story right (laughs). After the first season [of Trek], because my heart was still on Broadway and the performing arts part of me, the musical performing arts of me was yearning to leave. I never intended to be an actress other than in the theater. So for me, TV and movies, that was something to help me get from here to there. And so it was a shock for me to be cast in Star Trek. A shock and a joy. I was performing in England at the time of the inception of the show and my agent tracked me down in Paris and told me that they were doing a show called Star Trek, assuming that I’d know what that was. Now I’d known Gene Roddenberry since he’d given me my first TV starring role in a show that he’d done called the The Lieutenant. And he was one of the first people of that stature that gave me encouragement. He called my agent and said can you find Nichelle, because I need her for a role in this show and wherever she is, get her back here because I want a woman to be the head of a department on the bridge. And so I went on a Friday evening shortly before the end of the season to let Gene know that I wouldn’t be returning to the show, he looked at me like I was crazy, “You cannot leave,” but he realized how serious I was and he knew I was passionate about singing, and he said, “I know what your dream is and so forth but don’t you see what I’m trying to do? He said to take the weekend and think about my decision and how important this show is and how it was a first, and if I leave, well he didn’t know what to say, but he said take the weekend and that way I could take the time to really think about what we just said and come back Monday and we would talk about it and if you really want to leave then, you’ll go with my blessings, but realize I want you to know that what we are doing here is really historic. The next night was Saturday and I was due to be a celebrity guest on a dais at an NAACP fundraiser at UCLA. So I said certainly and I got up and turned around and maybe 10 or 15 feet coming towards me I see Dr. Martin Luther King and I remember thinking whoever that little fan is, he’s going to have to wait, because here’s Dr. King, who walks straight up to me with this big, magnificent smile on his face and says, “I’m the fan!” because I’m sort of looking around for someone else, and he says, “I am your best fan, I am your biggest fan!” and I… I was at a loss for words, and if you know me, I am never at a loss for words. I just couldn’t say a thing and he began to tell me how important my role was, what an inspiration it was. And you have to understand we were in the middle of the Civil Rights Movement, people were regularly being attacked by dogs, and marchers were being hosed on the television every night, real life things, and here I am in this futuristic thing on TV and he was so complimentary, he told me “I was so important and the way you have created this role,” and I am just looking at him and looking at him and I remember I just kept hoping he’d never stop talking. Because his voice is just… you know the voice. And I finally just start saying, thank you so much Dr. King and I am shaking his hand and still shaking from nervousness and I said thank you so much and I am really going to miss my co-stars. And I did not leave. I said I’d like my letter of resignation back please and I told him what had happened while meeting Dr. King, and I don’t know if you know what Gene looked like, but he was a big guy and was like 6’3” with that hawk nose and a great sense of humor and this brilliant mind and a futurist and–whatever great things you heard about him are just a small part of what that man was. And he reached down into his drawer and pulled out my letter of resignation and handed it to me, it had already been [laughs] torn up. As told to Savas Abadsidis. This was originally published on Planet Waves dot net. Used with permission of the author.